There are a few things to consider as you set out to draw realistically. Drawing realistic form begins with the understanding of how we visually perceive light and shadow and how these two relate together to give us the sense of three dimensional form. 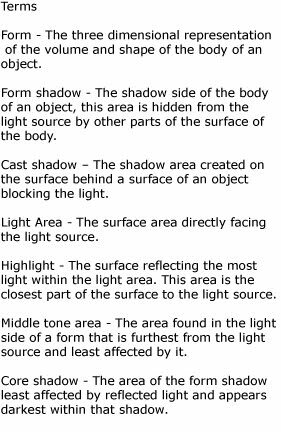 There are some basic principles you can use as a guide finding form using the information from the way light interacts with the objects it comes in contact with. It is through light and shadow that we see form. We visually use the information created from the interplay of light and shadow to understand the shape, size, and mass of an object. This is because light behaves consistently and this consistency is what gives us a frame work to to interpret three dimensional form. If you understand how the light behaves then drawing a realistic object becomes easier. Light is directional and it moves in a straight path emanating away from a point of origin. The light will follow this path until something blocks it form continuing on its course. The objects that block the light will absorb and reflect it, changing the direction of the path the light is traveling. This is what creates shadow. The space behind the object falls into shadow as the light is no longer able to continue beyond the surface in blacking the light path. That is the basis of the elements I describe below. Complexity of what is happening can scale up depending on the variables of lighting and surfaces involved but the basic principles will always apply. When the surface of an object blocks light from going any further it creates two types of shadows, form shadow and cast shadow. The parts of the object that are behind that obstructing surface are now in shadow. This is what we call the form shadow. Looking at the example of the sphere below you can see that as the surface of the edge bends away from the light it is now in an area where the light can not reach it. The other shadow type with is one that is created when the surface of the object blocking the light creates a shadow on the surface area behind it. This is the cast shadow. In the example below the sphere casts a shadow onto the area of ground behind where the sphere rests. Looking at the light side of the form, we can see that the light is strongest or brightest on the area of the surface that is closest to the light source and gradually weakens in strength as the surface moves away from that source. The brightest part of the surface is called the highlight. The darkest part of the surface is called the middle tone area. This is the area of the surface that is furthest from the light source while remaining in the light side of the object. Looking at the shadows, we see that the two kinds of shadows behave differently. The edge of a form shadow gradually transitions from the light side of the surface to the shadow side. This transition is makes the edge of the form shadow appear softer, creating a soft edge. The softness of the edge depends on the pace of the transition from light to shadow depending of the curve of the surface, a sharper edge, such as an edge of a box, will appear harder than a rounded surface such as a ball. The cast shadow is created by the outer edges of the object. As a result, the shadow does not have the gradual transition of a form shadow. The edges of the cast shadow have a hard abrupt end, creating a hard edge. Inside the shadows you will see the effects of reflected light. As mentioned earlier when the path of the light is interrupted it is reflected. When reflected, the light bounces of the surface in many directions, back towards the light source, towards the viewer, and towards other surfaces to be reflected again. One of the directions the light is reflected towards is into the shadows. 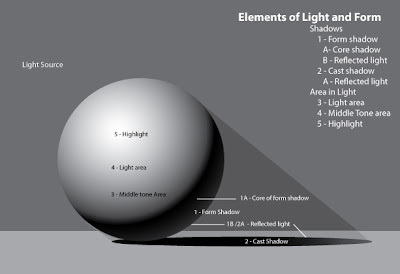 Using the example above, the light from the ground behind the sphere and wall hits the surfaces and bounces around in different directions the shadow areas. The shadow then isn't a single shade, it is actually made up of different shades. In the form shadow the edge closest to the the light side is furthest away from the source of the reflected light and least affected by it. This area appears darker than the rest of the shadow. This darker area becomes the core of the form shadow (The core shadow is the dark band on the sphere). 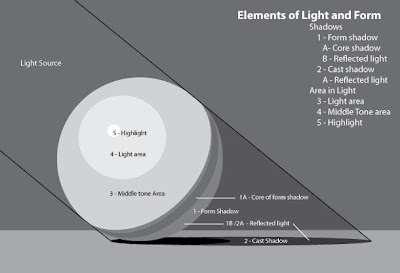 The rest of the shadow gradually lightens as we move away from the core shadow into the area closer to the source of the reflected reflected light. The same applies to the cast shadow. The area of the cast shadow closest to the object blocking the light is least affected by the reflected light. It will appear darkest near the object casting the shadow and will be lighter the further the shadow is from the object. Remember light behaves consistently and we can use this knowledge to guide us when rendering three dimensional form. Remember to look for the light and shadow relationships created by the directional nature of light. Keep in mind the differences in the ways form shadows and cast shadows behave, and how reflected light will impact both. Looking for this information as you draw will help you construct a believable sense of form.